KABUL -- Sitting in his all-male barbershop, 25-year-old Zabihullah longs for peace in Afghanistan -- but not one that would see religious police beating civilians on the streets for their hairstyles or outfits. He recalled working in a barbershop as a child under Taliban rule. "I remember the Taliban religious police every day would bring young men for their hair to be shaven off as a punishment, because they dared to style it," he said, his own hair long and tied back with a bow. Today it's a different story, and The Saloon -- one of many such hair salons that have sprung up in urban Afghanistan since the Taliban were deposed in 2001 -- buzzes with trendy customers seeking the latest Western styles while loud pop music plays in the background. Afghanistan's estimated 35 million inhabitants are overwhelmingly young, with about two-thirds of the population under the age of 25. Millions have grown up in cities swollen by refugees during the years of fighting. Zabihullah is part of this urban generation -- journalists and activists, models, hairstylists and social-media stars -- who have come of age alienated from Taliban rule and ideology. But as the Afghan-led talks aimed at ending the long war progress, they face the prospect of a peace that could hand the militants some semblance of power in Afghanistan -- and they are afraid. "I don't want a peace where I would lose my freedoms," Zabihullah said. Youth activist Mohammad Anil Qasemi was a student at the American University of Afghanistan in Kabul when the Taliban attacked the campus in 2016. One militant threw a hand grenade in his classroom, killing many of his peers. The blast wave threw him out of the second-floor window. He survived but with serious head, stomach and leg wounds. Now, as he watches the progression of talks between Washington and the Taliban in Doha, he fears his generation will not have a say in what comes next. "I am prepared to forgive the Taliban for what they did to me and my classmates... but I can't bargain on the freedom and achievements of my generation," he told AFP. The stance of young urbanites like Qasemi and Zabihullah contrasts with some of the older generation, who have simply lived through more years of war -- Afghanistan has seen nearly constant conflict since the Soviet invasion of 1979 -- and crave any respite. "I am prepared to grow back my beard, as the Taliban wants," said 50-year-old Haji Ahmad Shah, a customer in a Kabul shopping mall. "I have lost many friends and family in this war; I just want an end to it." Then there is Afghanistan's rural-urban divide. Some young Afghans living in the countryside -- where deeply conservative, patriarchal traditions stand in stark contrast to the relative cosmopolitanism of places like Kabul -- appear more willing to accept Taliban restrictions to achieve peace. Faridullah, a 23-year-old gardener in rural Kandahar, is relatively liberal, shaving his beard and listening to music. If the Taliban come, he said, he may lose those freedoms. "But it is okay, as I want security," he said. "For now I can't even go to my gardens because they have been heavily mined." The Taliban say they have moderated their stance on some social issues, though those living under their rule have told AFP otherwise. The group has not spelled out what role it wants to play in Afghan governance and civil society, other than seeking an "Islamic system". Young women, keenly aware of how their gender was banished behind doors and beneath burkas under Taliban rule, are among the most vocal in warning they will not compromise their rights. "For the Taliban, seeing a woman presenter on TV is intolerable, and for me losing my freedom and rights as a woman is intolerable," said 21-year-old Diba, a newsreader for Zan TV. "I might have to leave the country or die of depression living under Taliban rule," she added. But some urban youth say they are willing to make peace at any price, while hoping for the best. Farshad, a 23-year-old salesman with a trendy fade haircut who works at a Kabul store selling Western suits and fedoras, said he was prepared to turn it into a shop selling traditional turbans if it meant an end to fighting. "I just hope they don't touch my haircut," he said. Amid heightened Taliban and ISIS attacks, more young men have taken to bodybuilding gyms as a mechanism to cope with stress and loss. 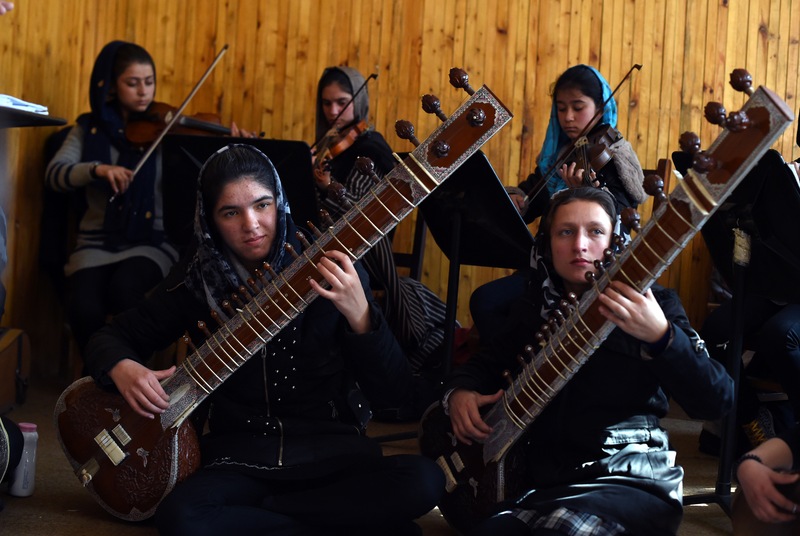 Zohra, an ensemble of 35 young musicians aged 13 to 20, is giving young Afghan women the chance for a different life. 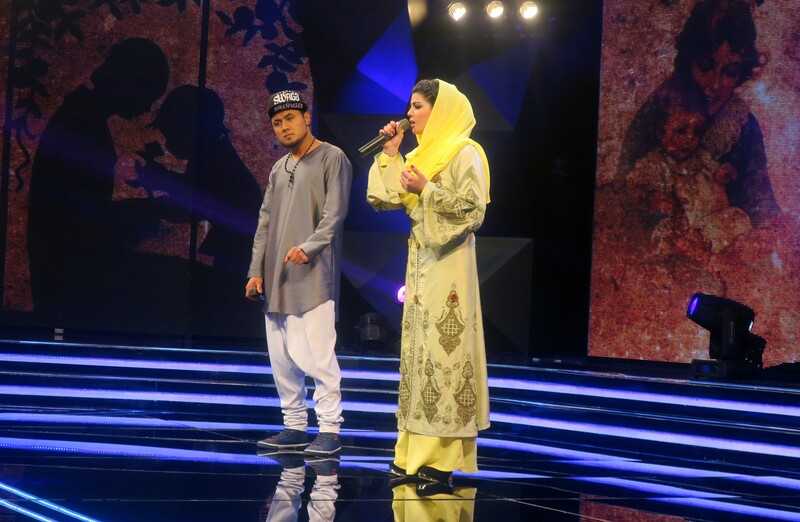 A Hazara man became the first rapper to win the contest, but he gave his award to his female competitor in the final amid wild cheering.